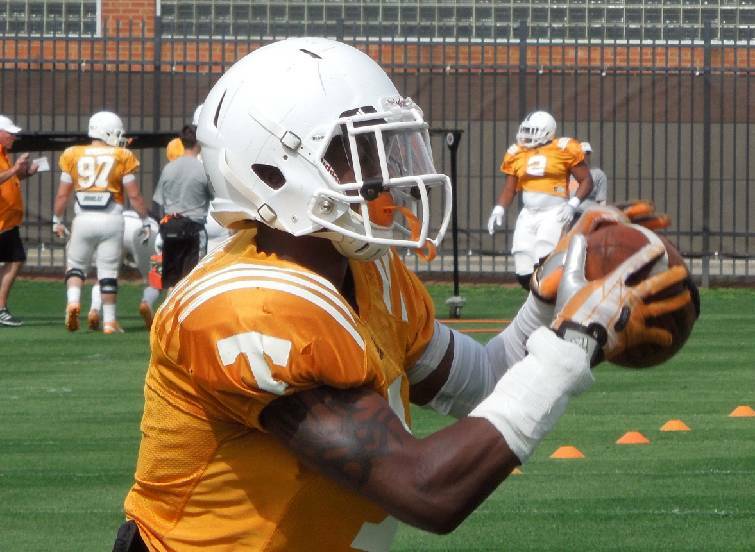 Tennessee cornerback Rashaan Gaulden hauls in a pass during drills as the Volunteers practice on April 9, 2015. Tennessee cornerback Cameron Sutton, who normally wears No. 23, dons the No. 7 jersey usually worn by Rashaan Gaulden, the defensive back who suffered a foot injury earlier in the week, during the Vols' practice at Neyland Stadium on Aug. 22, 2015. KNOXVILLE -- Tennessee suffered a big blow to its defense on Thursday. Sophomore defensive back Rashaan Gaulden, a likely starter on defense, will miss the entire season after suffering a foot fracture during a punt return drill on Thursday. "Rashaan meant so much to us, not only from a defensive standpoint, but on special teams as well," Vols coach Butch Jones said after Saturday's practice. 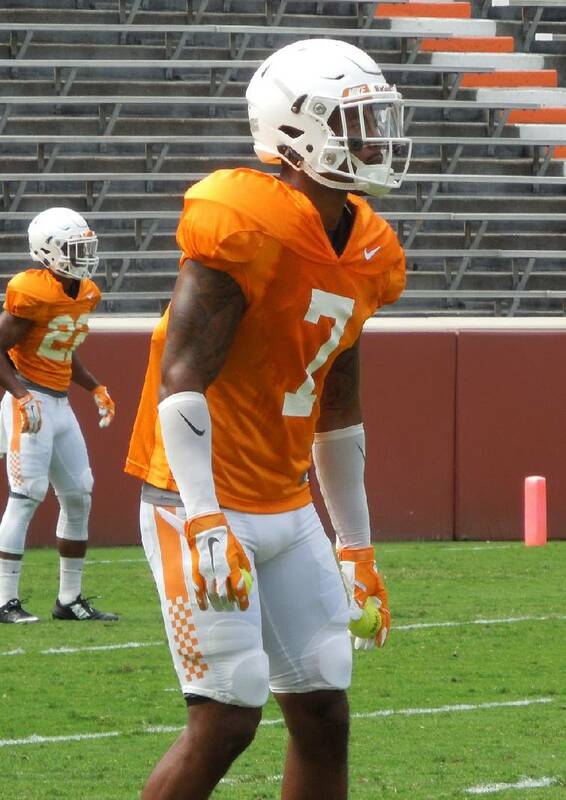 Cornerback Cameron Sutton has requested to wear Gaulden's number this season, and he practiced in a No. 7 jersey on Saturday. Tennessee already lost two offensive linemen (Marcus Jackson and Austin Sanders) to season-ending biceps injuries this preseason. The 6-foot-1, 178-pound Gaulden played primarily on special teams in 11 games as a freshman last season, but his role was set to expand to the defense this season. The sophomore has been locked in as Tennessee's first-team nickel cornerback since spring practice, and there was a confidence in the program that he could further solidify the position Justin Coleman played in 2014. That won't be the case for most of the season, however, leaving Tennessee with a key spot to fill on its defense a little more than two weeks before the season opener. Sutton is a logical pick to slide inside when the Vols go to a defensive package with three (or more) defensive backs. In that case, either Justin Martin or Malik Foreman then would take Sutton's place at the outside corner spot opposite Emmanuel Moseley. Martin is a talented junior college transfer, but he's missed most of the preseason with a knee sprain he suffered when he was bent awkwardly under a pile of players during practice. He was doing some agility work on the side of practice on Friday. Jones said Martin is expected to return on Monday. Heading into the preseason, Foreman was being considered for a move to receiver, but he's remained in the secondary. He's played in 22 games as a reserve and special-teams player. His most extensive action defensively came last November when he filled in for Sutton during a couple of first-half series against Missouri. Foreman has gotten some nickel work since Gaulden's injury. Freshman Micah Abernathy has been getting the most work at the nickel spot this preseason. Fellow freshman Darrell Miller also could play there. Safety Evan Berry is another possibility, having worked there some last season, but he's been focused solely on safety this preseason.